Touch Display Research market report 2017 bundle deals - Touch Display Research, Inc.
Santa Clara, California, November 18, 2016— Touch Display Research Inc., a market research and consulting firm, is pleased to announce the market report 2017 bundle deals. Corporations and businesses can purchase several of our market research reports for a discounted price. You can pay now and start to receive the 12 monthly reports, and take your time to pick the special reports in 2017. 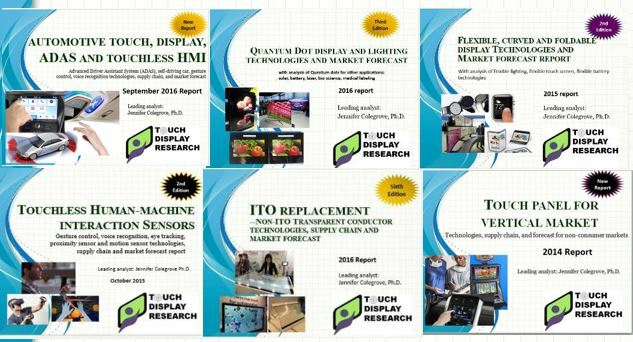 Our new reports include: Automotive touch, display, ADAS and touchless report, In-cell on-cell touch display report, Sensors for augmented reality, virtual reality and artificial intelligence report, ITO-replacement: transparent conductive material technologies, supply chain and market forecast report, Quantum dot report, Active pen report, Flexible OLED display report and many more. Bronze membership––$11,000 annual fee––The Bronze client will receive 12 of our monthly Touch and Emerging Display reports, and may choose two special reports. You can choose to publish 12 of your press release at TouchDisplayResearch.com, with link to your website. Silver membership––$19,000 annual fee––The Silver client will receive 12 of our monthly Touch and Emerging Display reports, and may choose four special reports. You can choose publish 12 of your press release at TouchDisplayResearch.com, with link to your website. The Gold Membership is the highest level of client, who will receive all our reports in 2017. The Gold Membership also includes a half-day interactive meeting or presentation at client’s workshop or conference. For only $31K, it’s as if Dr. Colegrove works for your company for a whole year. You have the option of listing 12 of your company’s press releases at TouchDisplayResearch.com, with a link to your website. *The membership fee is for each corporation. For industry organizations with n corporations, the membership fee will be times n.
“We like your monthly report. It’s like you are traveling for us to over 10 international conferences each year, and writing travel reports too. Since we are very busy every day with meetings and lab works, we can’t attend many conferences. Your monthly reports keep us updated with all the new trends.”– a client of the Touch and Emerging Display monthly report. About Touch Display Research Inc.
Touch Display Research, Inc. (www.TouchDisplayResearch.com) is an independent technology market research and consulting firm specializing in touch screen and emerging display technologies such as OLED displays, OLED lighting, flexible displays, e-paper displays, ITO-replacement, Active pen, 3D displays, near-eye displays, pocket projectors, quantum dots, gesture controls, voice controls, and eye controls. Touch Display Research provides standard reports, consulting projects, and due diligence for touch suppliers, display manufacturers, consumer electronics ODMs/OEMs, material suppliers, investor companies, venture capitalists, and companies who are merging or acquiring companies in the touch screen, display, and materials industry. We are member of Flextech Alliance, SEMI and SID.